Happy Tuesday! I have some news for you today from my sponsor, FabricCadabra. They currently have all of their sale fabric marked down 40%! There are some crazy good deals on some amazing fabrics. Love all the Cotton and Steel fabrics. I've some Garland fat quarters but not quite enough to make a quilt so would love some Tinsel to add into the mix. Thanks for the chance to win. Lots of beautiful fabrics. My favourite is Town Center in Azure - Violette by Amy Butler. Oh I love the Succulence collection by Bonnie Christine , especially the one with the succulentplants on it and the drops fabric. So lovely! So many incredible choices! I love Plumage Apricot- Northern Migration- Winged designed by Bonnie Christine for Art Gallery Fabrics. I'm in love with the peppered cottons...especially seaglass. Beautiful!! Any of the peppered cottons are nice. If I had to choose maybe jungle or blue jay. Thanks! I love the boardwalk delight prints. There are many great fabrics. Two of my favorites are Flavor of the Day and Sunday Clippings. The Blueberry Creamsicle bundle is delicious! I really like the Bundle of Berry basics. Very pretty and bright fabric. Thanks for the wonderful giveaway. I like the fabric Headlines in the Evening. I have done a quilt using stripe fabric and it is amazing. So much fun. Thanks for the giveaway. Sunday Clippings by Katy Jones. Thanks for the chance! The colors in the Fat Quarter Bundle - Morning Song by Elizabeth Olwen for Cloud 9 Organic Fabric really called to me this morning...comforting colors and lively floral prints! I love Bluebird - Flock - Rashida Coleman-Hale - Cotton and Steel Thank you! August Dandelion in teal by Sarah Watts. Pandas too! Love Cotton + Steel's Wordfind! I love the Tapestry Rose - Les Fleur by Rifle Paper Co for Cotton and Steel, it has a Scandinavian feel to it! Lots of great fabrics here! They also have some of the Playful collection left-Wordfind and Jacks are 2 of my favorites for quilt backs! 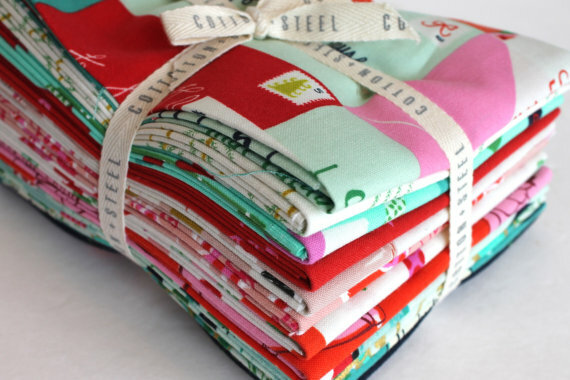 I like "I'm a Maker" by Art Gallery fabrics. I love text print. Thanks for a chance at this great giveaway! Love the Art Gallery collection with Pandas. The Hidden Panda Cottonbud is a great print that would make a fun background! I love Cotton and Steels basic bundle. Thanks for the giveaway! The Whimsical Wood in Gray - Sweet Autumn Day- is so pretty, but I love them all! Thank you so much for the opportunity! Love the C+S Rifle Paper Company designs - so pretty! I am a huge fan of peppered cottons but also love all the C+S selection. Thanks! I love that Shabby Strawberry FQ bundle! I could use a big chunk of Melody Miller's apples for a quilt back! How fun would that be?! I want AG's handcrafted Bouquet in Navy....I only have a fat quarter now! I LOVE the Bamboo Shoots Light and Cool in the Pandalicious Collection. Thanks for the chance to win! Sundborn cloud. Thanks for opportunity! I have always loved all the sweet Penny Rose Fabrics, so The Shabby Strawberry Fat Quarter Bundle is my personal favorite! Such a lovely giveaway! Oh my..soooo many great choices...looked for long time...and going with my first loooooved pick! lol LOVE the "The Shabby Strawberry" Fat Quarter Bundle!! Would make such a fun Summery quilt!! There are many favorites and I picked Mochi by Rashida Coleman-Hale . Quite a few choices! I pick Abundance in Monsoon. Drenching Aridity Metallic - from Succulence caught my eye. Thanks for the chance - I'm definitely in a Christmas fabric mood. I love all the Meadow prints from Lizzy House, like the Bramble. Thanks!! I like Fruit Dits by Melondy Miller. Okay, I have never seen those peppered cottons before. I like that stuff. I would love some in a few colors. FabricCadabra has a lot of good stuff. Hard to pick! But I love the Fairy Rings in Lavender. Thanks for the giveaway! So hard to choose but I really like Hello Bear by Bonnie Christine...would make a cute baby quilt for my new grandson. Thanks for the sweet giveaway! I love Pandalings Pod Assured by Katarina Roccella! I love everything by Cotton and Steel. Hi,I like "Tinsel"! Thanks to You+FabricCadabra for a sweet Giveaway! My favorite fabric is Pandagarden Recess - Pandalicious Collection by Katarina Roccella for Art Gallery Fabrics - with it teal colorway. I just love pandas. dhardenburg (at) prodigy (dot) net . I’m a sucker for a bundle. Loving the Cotton and Steel Basics bundle at Fabricadabra. Such eye-candy! Snapperdoodles Who could pick a favorite? I do love the flamingos in ivory by Rifle Paper Co...but those Viewfinders always have a special place in my heart! I am old enough to remember when they came out and how "high tech" they were! If you didn't insert them correctly it was like having crazy double 3-D vision! Thank you for the give away and for the look see at all that gorgeous fabric! Love the bundle of berries! So many to choose from but Traffic in Denim - Loominous Yarn Dyes by Anna Maria Horner is my favorite! So many great choices, it was hard to pick. I love the Haiku bundle and Desert Blooms. Thanks for the chance to win! I like the Shabby Strawberry bundle. I like Cotton - Steel - Horseback Green - Honeymoon. I love Hidden Panda Cottonbud. It is too cute for words! The leaf lines in the clearance section was awesome! Thanks for introducing me to this shop! Lots to love there but I really want: KNIT - Hidden Panda Cottonbud - by Katarina Roccella. Thanks for the chance! Love love Boardwalk Delight 1/2 yard bundle.I just may need to get it. I like Amy Butler's Field Poppy Sky - such a beautiful floral. Great choices, I would take some AG fabric maybe Strawberry Field in blue. Love the cream on cream dots! Nice selection. I like the Coton & Steel Basic Bundle. Thanks! I love that they have a great selection of C&S fabric. Especially like the basic bundle! Thanks for the chance to win! I love Les Fleurs fabric! I'm partial to the Cookie Book bundle. I like "Arizona by April Rhodes - Art Gallery Fabrics". Thanks for the giveaway :-). That Violette Minty FQ bundle by Amy Butler jumped out at me. So not fair to make us pick just one thing! :D Thank you for the opportunity to win a giveaway. All beautiful fabrics! So much to love! Elixir in grey (cotton and steel) is just wonderful. So many great fabrics to choose from! My favorite is anything Amy Butler, so my choice would be Meadow Blooms Butter-Violette. I could make a long, long list, but I will say Folk Birds Black. Stunning! Thank you for the opportunity to win. So many gorgeous fabrics! Boardwalk Delight, especially Flavor of the Day, is so fun! I love Traffic in Cherry from the Loominous collection. I would love to make a skirt with joie de vivre. I really love the Morning Song bundle by Elizabeth Olsen. I love a good basic so my favorite is the Swiss dot white fabric with black dots. Thanks for the chance to win! The Innocent Charm in Rose - Croquette line would make a wonderful main fabric for a soft, feminine quilt. I love the Les Fleurs Queen Anne in Navy with metallic accents. Lazy Daisy Raspberry. It reminds me of fabric my mom would have bought in the 1970s to make me a dress! Tulip Tangled in Blueberry (among many others)! Lazy Daisy Raspberry - Dreamin' Vintage by Art Gallery Fabrics is one fabric that caught my eye....so many pretty things to choose from! I really like Oh Hello Meadow ...such cute animals! One of my favorites is Horseback Green - Honeymoon by Sara Watts for Cotton + Steel. I think I could use it for a subdued equestrian wall hanging. I love the tinsel pack by Cotton & Steel and the peppered cotton. So many pretty fabrics to Choose from. Thank you for a chance to win. I love the netorious in teal (Cotton & Steel). I think it would be a fabulous binding. Ohhh Dots Tile Fresco is delicious - greens always get me!! !